Last night I was Internetting when I came across an interesting tidbit. According to a comment thread on a vegan forum (I can't remember which one - the Internet is a wild place!) 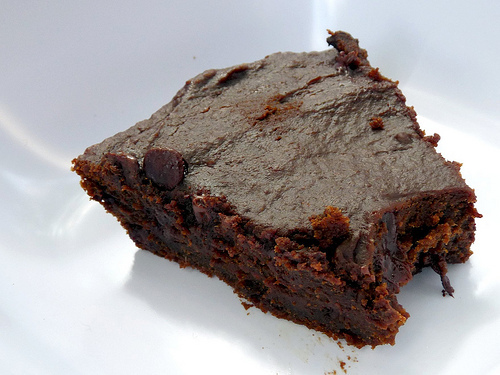 someone said that a box of brownie mix + a 15oz can of pumpkin = the perfect vegan brownies. Naturally, I was intrigued. And, since I had both those ingredients in my cupboard, I decided to give it a shot. It seemed too easy to be true, but I put my trust where it belongs - in the Internet, naturally. Poured the brownie mix into a bowl. Added the pumpkin. Began to mix the two together, ended up with what appeared to be pretty good looking brownie mix. Poured the mix into a glass pie plate (I don't have a square brownie pan - oh, the horror!) and baked according to the directions on the box. Forty minutes later, I had brownies! But how did they taste? 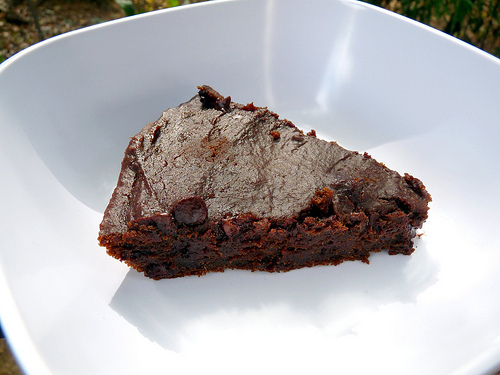 One time I made black bean brownies, a recipe the Internet had raved about, and ended up tossing the whole pan of them - they were disgusting, and maybe my baking skills were to blame but I'm pretty sure the culprit was the can of black beans. 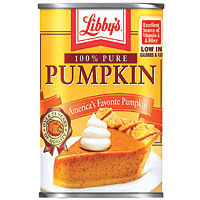 Also, I am not a huge fan of pumpkin. Or brownies, for that matter. I prefer cupcakes and cookies and pie. So perhaps I am not the best judge of brownie recipes, which makes what I'm about to say even more important. Y'all, these brownies were good! The pumpkin is very subtle - you hardly notice it at all! 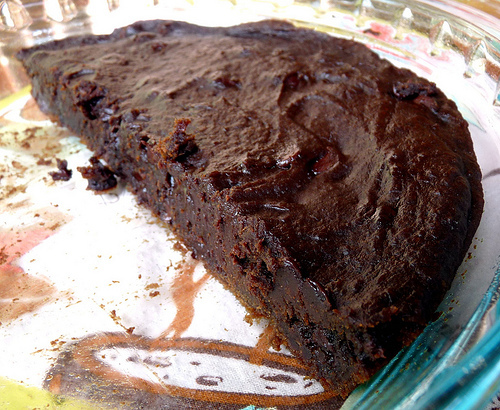 My main complaint about vegan brownie recipes are that they are either too dense, too cake-like, or too oily. These brownies were none of the above. They were thick and fudgey with a super sweet, chocolaty flavor. Nathan actually asked if I said "brownie" when I mean to say "fudge," so if that's your thing than this recipe is a winner. PS: Don't forget to vote! I'm currently in 15th place!